Stores up solar power for a glorious, color-changing glow each night! When charged in direct sunlight, its battery automatically activates the color-changing LED light at dusk, turning off at dawn or until battery runs out or when audience light is detected. Simply stake it in the sun, and enjoy the lighting! 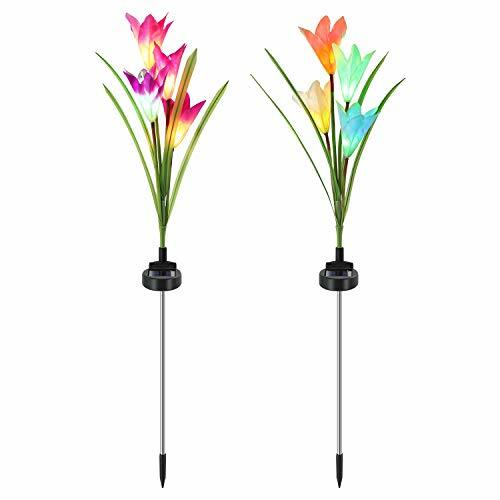 Its lifelike lily structure makes it a graceful decoration during daytime and striking colorful light in the dark. Perfect for staking in your garden, path, lawn, flowerbed, pond, backyard or anywhere with soil. 1.The selected location should not be near strong ambient lighting, such as street lights, which may cause the light to turn off automatically because the sensor inside will detect other lights. 2.The lighting time and brightness may vary with your geographical location, weather conditions and seasonal light availability. 3.Place the light in an area with full sunlight. 4.DO NOT hold the artificial stem or flower if you want to take off the mounting pole, please grasp the part that is holding the solar panel to take off the mounting pole.